I've come to realize over the years that I can plan and plan but that, in the end, I often go astray from those plans. Why? Because I'm human. I don't see the whole picture. God does though. This past year I had to change my plans several times. I'm thankful to the people with whom I was working on the FGS Conference for Knoxville who knew when they needed to help a little more when I was dealing with my mother's diagnosis with cancer, surgery, extended illness, and ultimate death. I had to slow down a bit after a foot injury at FGS caused me to have to stay off my feet a bit more for much of the remainder of 2010. My left foot healed by October, but my right one is just now at a point where I can bear to apply fairly normal pressure on it. I have been able to research in some facilities, but others which required more walking were not an option for me. As far as 2010, our church choir had planned to go on a mission trip to northern Vermont. I was looking forward to going there because Vermont is one of the states that I've not had the privilege of visiting. I was also going to be able to cross the border into Quebec and add another Canadian province to my places visited category. Those plans were shattered when a long-time employee of the church was discovered to have embezzled 1.5 million dollars. Much of our operating funds were frozen for a time while the investigation took place so we were going week to week there for awhile. I decided to see if there were any openings at Samford (which had been a conflict with the choir mission trip) and found that there was one opening in the Military Records class so I signed up and went to Samford instead. I made several research trips to Nashville -- some of those included client work, but many were able to include at least some personal research. All of these were not in my original plans for the year, but it's hard to imagine anything else at this point. Now - what are my plans for this year which will likely alter over the course of the year? In the next few weeks I'll be updating the handout for my NGS presentation about Mississippi research. This is a fairly recent handout so it probably won't change drastically, but I like to update them from time to time. I'm planning to carve out a little more time to work on FamilySearch Indexing projects. This is likely to take place by making myself indexing at least one census image which usually requires about 15-20 minutes before beginning another project. I want better access to the articles in the journals and magazines in my personal collection, so I'm going to continue to gradually add these to LibraryThing as titles owned, tag them, give the remaining bibliographic citation (journal title, volume, issue, publication date, pages) in the publication field, etc. I have a couple of lectures that I'm extremely interested in developing. I've had them on paper for awhile and need to get them "ready to go." I suspect that finding examples that I can use to illustrate my slides and getting permissions to use the images will be the time-consuming part. I have one goal which I don't wish to share publicly at this time. I will spend time working on this goal off and on throughout the year. It's actually one that is already in progress. With a full-time job and other commitments, it will likely take longer than this year to achieve. Will all this be achieved? I don't know, but God does. This post was composed for the 101st edition of the Carnival of Genealogy. This morning I happened to notice an article in the morning paper advertising a new book entitled The Roots of Elvis Presley. I got excited thinking that someone had documented his family's ancestry, but the deeper I got into the article, the more I realized that the book had been mistitled. The book might be a good source of information if you want information on Elvis and his parents, but it apparently has very little to do with genealogy beyond his immediate family. The book came out just in time for the celebration of Elvis' birth which attracts many visitors to the Tupelo area. I suspect a lot of people are going to pick it up with expectations that the book will delve further into Elvis' ancestry and are going to be disappointed. I'm still in Mississippi for the holidays. Last night I decided to venture out to a store called Hudson's Dirt Cheap. I've been several times when they had a great supply of closeout books, but I wasn't that lucky last night. I'd been told that they had a lot of Christmas close-outs from Target earlier during the day, but either they were gone or I just didn't find them. (Someone said they'd been able to get a 7.5 foot Christmas Tree for $1.) My mom used to call the store "Push & Shove." That's about what you have to do there. The aisles are too narrow. You can't meet anyone else with a cart on them because the aisles are nearly too narrow for a single cart -- much less for any to pass. I don't have the patience to pick through the clothes which have size labels on the racks which are meaningless. I know a lot of people have found quite a few bargains, but it's too crowded with not enough space for browsing. The electronics in stock appeared to be the ones returned to various stores with problems. All the boxes were damaged as well. There were a bunch of DVDs that looked as though the shrink-wrapped containers had been dropped in a giant mud puddle. The floors are filthy. Many aisles are barricaded with yellow "crime scene" tape (making you wonder what folks did on those aisles). It's particularly aggravating if you get to the end of one of those narrow aisles in the clothes section only to discover that you cannot exit into the main aisle to round the corner to the next aisle. It's no fun backing your cart back up the entire aisle. There's no room to turn around and go forward. While I'm enough of a book addict to take the time to sort through those when available, I'm not willing to take the time to search through other things. Push and shove is exactly what you have to do. I'm not sure why people are willing to put up with a filthy store and all the inconveniences. I guess it is the feeling they get when they do find the bargain. I really prefer to find my bargains in cleaner stores. I'm just surprised that the health department hasn't condemned that one! It's a White Christmas in 2010! These pictures are taken from my Dad's house in Mississippi which is where I am for the holidays, but it's a White Christmas at home in East Tennessee too. 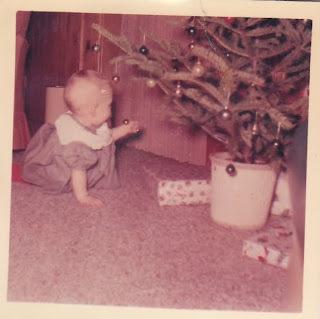 Now, for a little look at a Christmas past. 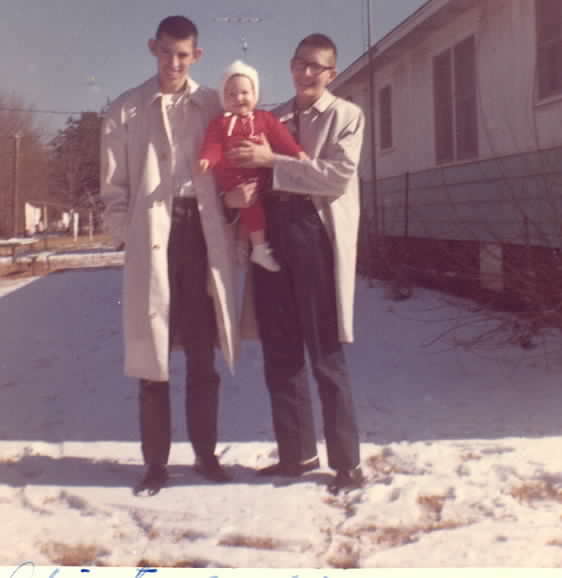 This was my very first White Christmas at the age of 10 months. After Mom retired, she and Dad traveled throughout all of the lower 48 states. They didn't make it to Alaska or Hawaii, and I think she really would have loved to have gone to Alaska. Of course, Dad had been to Hawaii during World War II in his naval service. While they were in Oregon, Mom came across cranberry fudge. She tried it at multiple places, but the one she really loved came from one lady's shop. She ordered it at Christmas for the family, but after a couple of years, the store went out of business. She ordered some from an alternate location, but it just wasn't as good. That's when she decided to try making her own. She tried several times and finally got a recipe that tasted very close to the one she had loved so much. Combine sugar, cranberries, evaporated milk, butter, and salt in heavy pan. Bring to a boil. Boil 5 minutes, stirring constantly. Remove from heat. Stir in marshmallows and nuts. Stir vigorously until marshmallows melt. Beat until thick. Add 2 to 3 drops of red food color, if desired, for a darker color. Pour in greased square-shaped pan and cool. Mom used her Kitchen Aid stand mixer to beat the mixture after removed from the heat. It takes quite awhile to get it to a thick enough consistency that it will set. If you don't have a stand mixer, you will want to take turns beating it because you'll get tired pretty quickly! Dad says she sometimes left it for a couple of days before cutting it into pieces. This appears to be a picture of me enjoying my very first Christmas. I'm probably about 10 months old in the picture. I won't tell how many years ago it was! This was, however, back in the days when we had a real tree instead of an artificial one! I've spent some of the last couple of days scanning photos that were at my dad's house. I'd brought a bunch with me to scan this past summer and to return at Christmas. I'd done quite a few, but I still had a lot to go so I buckled down and started scanning. I honestly do not know who is pictured in this photo other than the notes on the back. 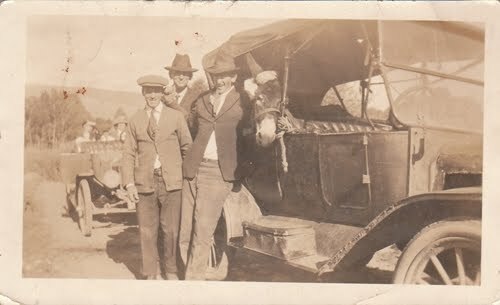 There is a resemblance between some of the men and some of the men on the Thornton side of the family. I do plan to ask my dad about the photo when I see him at Christmas. Let's just say this is one place I was surprised to see a donkey! With the cold frigid temperatures, snow still on the ground from earlier in the week and snowing now with the possibility of a layer of ice on top it by morning, I was reminded of this poem that we memorized in elementary or middle school. One of my favorite singers is Gerald Wolfe who sings lead with the group Greater Vision. There are two Christmas songs that he sings that are among my favorites. One of these is the song written by Lanny Wolfe called "Cherish That Name." I couldn't find a YouTube recording sung by Gerald of it so I opted to go with the other one, "O Holy Night." According to Wikipedia, "O Holy Night" was composed by Adolphe Adam in 1847, but the version we know came to be in 1855 when John Sullivan Dwight, a Unitarian minister, created a version for singing based upon the French song. Fall on your knees! O hear the angels' voices! 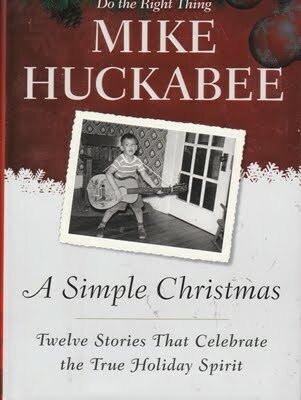 Huckabee, Mike. A Simple Christmas: Twelve Stories That Celebrate the True Holiday Spirit. New York: Sentinel, 2009. York, Lynn. 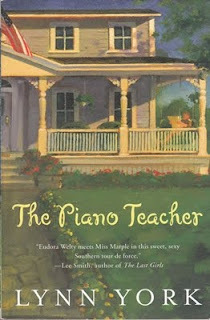 The Piano Teacher. New York: Penguin, 2004. Most of you are aware that it's voting time for Family Tree Magazine's favorite blogs. As I began to go through the choices -- and yes, I loaded every blog to give all those with which I was unfamiliar as well as those I read regularly an equal chance, I noticed some trends. I tended to not vote for blogs which had almost meme-related posts exclusively. With the Advent Calendar of Christmas Memories in full swing, I had to scroll back all the way to November to see non-meme posts for some blogs to see what those writers I did not regularly read brought to blogging which was unique. Blogs that only posted to memes such as the tombstone and wordless ones showed little creativity in my opinion. Blogs with super long entries also did not fare well in my voting. With the number of blogs that I try to read, it would be impossible to read entries like that on a daily basis -- especially if they were not immediately relevant to my own research or to areas in which I spend a great deal of time researching. Blogs that focused almost exclusively on reviews also did not get my vote. I think I've seen too many software reviews lately. One blog that I used to read regularly and enjoyed is so full of software reviews now that I've considered dropping it from my feed reader. It used to be more eclectic in nature. I haven't been blogging as much lately. There are a variety of reasons contributing to my lack of blogging . . . other priorities, illness in the family, blogging burnout, and working on client research rather than my own. I have good intentions, and I know I need to get back to it, but I haven't. I also noticed signs of this same problem among some of the blogs that were nominated. One blog (which used to be a favorite) had not been updated in the last calendar year. I've at least written a handful of posts in that time. Others were infrequent, having only a handful of posts as well. Other blogs seem to be suffering a little "fatigue." They aren't quite as engaging as they once were. It's as though they were writing out of a sense of obligation rather than having something about which they are excited to share. I'll also confess a little secret to you. I hate the word "geneablog." I prefer to use the phrase "genealogy blog" or "family history blog," a term which is much more likely to be utilized by those looking for genealogy-related blogs than an invented term. I know that the English language is evolving, but that's one term that I'd rather have omitted from dictionaries. It's so prevalent that its use will be continued in genealogy blogging circles regardless of my thoughts on the matter. I think the one thing that bugs me about the use of the term is that I feel "trapped" by it. When I began Smoky Mountain Family Historian back in June of 2004, my intent was never to blog exclusively about genealogy. My intent was to blog about anything that interested me or caught my attention. It was to be a reflection of my whole person. I often shared reviews of books that I read. I shared things about my cat. I shared other things. In order to recapture my enthusiasm, I'm going back to my original intent for this blog. You are going to see many aspects of my life as well as glimpses into my genealogical research. I hope that this change back to the original direction of my blog does not cause you to leave. I just need to recapture my enthusiasm for blogging! Yes. There truly is one in every family. It's impossible for our family to create a meal without alternatives around the holidays. It's not the older generation that is the problem. It's the ones under age 35. Turkey . . . fortunately most of the family will eat this. Of course, it is my cat Brumley's favorite part of the holiday meal. Cornbread dressing . . . only those over age 35 will eat this. Fortunately those of us over 35 don't mind because it leaves more for us (until we've had it as leftovers for a 3rd time). Cranberry sauce . . . This is a tricky one. My dad, my brothers, and I will eat this. Mom always served the jellied kind out of the can. I prefer making it myself, but the family eats the jellied kind better because of tradition . . . so I usually suffer. Rolls . . . this is one item everyone will eat. Green beans . . . generally speaking, it's those of us who are older who eat this, but I was shocked when, at Thanksgiving, one of my nephews actually put some on his plate. He didn't eat a lot of green beans, but he ate a few. There may be hope for that younger generation yet. Sweet potato casserole . . . some will eat; some won't. Cheesy potato casserole . . . one of my newer favorite dishes. We started making it because one of my nieces really liked it. We're not sure if she knew it had onions in it when we first started serving it, but she does now, and she still eats it. Mashed potatoes . . . served as an alternative for those who won't eat the cheesy potato casserole and/or dressing. Fruit salad . . . another food that everyone will eat. Carrots with ranch dressing . . . for my youngest niece who is now a senior in high school. Pecan pie, Pumpkin pie, Cheesecake supreme . . . everyone will eat at least one of the choices offered (although why some of my nieces and nephews would ever eat the boxed cheesecake you buy at the grocery store after eating the homemade variety we serve, I don't understand). Chocolate . . . Can you believe that I have a niece who won't eat chocolate? We even have Swiss ancestry!!!!! She needs to learn to embrace her inner Swiss. I always tease her that I'm not sure we're related. Of course, we have coated pretzels, fudges, cheese balls, summer sausages, and other things to munch on during the holidays as well. * Can you identify person or event that started you on this search for family information? * Did you pick up researching where a relative had left off? * Did your interest stem from your child's school project on genealogy? * If you have been researching many years, it may be hard to pinpoint one reason for this journey. 2) Write your responses on your own blog, in a comment to this blog post, or in a note or comment on Facebook. Now, I can honestly say that I'm the only one to blame for my own genealogy addiction. When I began researching genealogy that I knew of no other relatives who had researched a single thing about our family. We had no school projects on genealogy. The only thing I knew is that my Mom had always wanted to know something more about her great grandfather Walton Harris. At the time I began researching, I was living in Cincinnati. I knew that it was one of the top genealogical libraries in the country. I just decided to try my hand at it -- a surprise for Mom. It didn't take me long to move to other branches of my family. I found more interesting lines and pursued those. I was shocked when I discovered New England ancestry. I'd grown up in Mississippi and never imagined that I'd discover ancestors in Massachusetts, New Hampshire, and Rhode Island. However, my New England ancestors are by far my most interesting ones. In those early years, when I got discouraged on a Southern brick wall, I'd always turn to my interesting New England ancestors which would put me back in the discovery phase and get me past the feeling of being defeated by a particularly difficult brick wall challenge. I mentioned that when I started that I knew of no one else in the family who had researched the family. I did learn about some who had after I started. 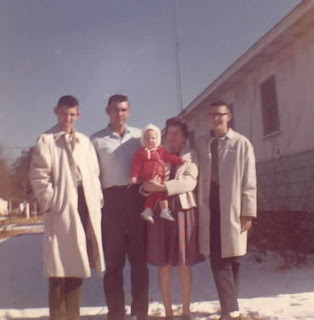 I learned that Mom and Nanny (Mom's mom) had gone to the courthouse in Pulaski, Tennessee (Giles County) only to be told that all the records had perished in a fire. I'm really not sure who they talked to, but there are quite a few records which did survive. They just found an unhelpful clerk on that date. I also learned that Mom's Aunt Marie had researched the Lantz and Taylor lines fairly extensively. However, by the time I discovered this, I already had these lines well under way with much of the same documentation she had. I've never actually seen Aunt Marie's research, but her granddaughter has much of it, and I've corresponded with her. Someone on the Thornton line had done a little bit of research too because the reunion booklet shows signs that some research was done, even though it was not documented. I'm still not sure who compiled the information in that older booklet, but I do know that Dad's first cousin took it and researched some more -- as did I. However, I was addicted before I made the discoveries of other researchers -- and I have no one to blame for myself! I stumbled across a rather interesting family (at least according to the online family trees which are in various states of documentation ranging from none to mediocre). I had copied various Harris and Davis marriages from the Lincoln County index in Mrs. Harry Kennett McAdams' book Kentucky Pioneer and Court Records: Abstracts of Early Wills, Deeds and Marriages from Court Houses and Records of Old Bibles, Churches, Grave Yards and Cemeteries (Baltimore: Genealogical Publishing Co., 1961). One of the marriages was for a Samuel Harris to an Elizabeth Van Cleve on 25 October 1784. (p. 112) I will admit that this Samuel Harris is in Kentucky earlier than my family appears to have been. I decided to see if I could find anyone researching this couple in an effort to discover how these families might or might not be related to my Harris and Davis families. As I inserted the couple in a search in WorldConnect (http://wc.rootsweb.ancestry.com/), I came up with something quite interesting just from the locations mentioned for Samuel's birth and death. Samuel was said to have been born 20 Nov 1763 in Bechman Twp., Dutchess Co., N.Y. I recognized that immediately as the area where the Beekman Patent was. At least one tree stated that he was born in neighboring Nine Partners rather than Bechman Twp., but it was still in the area. There is a note in one tree that states he was a member of the Reformed Dutch Church. His death location was listed as Pleasant Hill, Mercer Co., Ky. I immediately recognized this as what we call "Shakertown." In fact, some of the trees elaborated a bit more on this connection. It appears that Samuel and his wife Elizabeth, said to have been a North Carolina native, became Shakers in 1806. Seven children were listed in one of the trees, and it was noted that all of their sons eventually left the Shakers, but that the daughters remained. Samuel and his wife Elizabeth are said to be buried in unmarked graves at Shakertown. I found this connection between the Beekman Patent and Shakertown to be very interesting. I'd love to do further research on this family to try to prove or disprove the claims made in the online trees. In the process of my efforts to make sure all my notes, photocopies, etc. 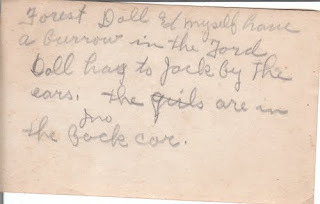 are filed in a more easily retrievable manner, I began tackling a notebook that contained some of my earliest attempts in genealogy. This particular notebook contains information from at least three families that were connected with each other. I've not worked on one of the families in at least a dozen years (maybe even longer). As I am going through the materials, I'm trying to see what is in my database and what isn't, if it pertains directly, in an identifiable manner to my direct or collateral lines, and add it if necessary. For things that were attempts to crack the brick wall on this line, I'm going back to try to annotate some of the research so that I can see if I can make it a bit more meaningful to try to get past the brick wall, and typing it up (with footnotes) to get it in a more retrievable format. I've come across some interesting things. I had handwritten notes on notebooks in 3 ring binders without reinforcements. I've discovered a page of notes with the bibliographic information missing on one of the items. What I do know about the source is that on pages 143-147 (at the very minimum) is a list of early marriages of Cumberland County, Kentucky. My notes indicate that the source stated that the county was formed in 1798 and included large parts of several counties, one of which was Wayne County. I also have a note that the list that follows was made by Mrs. Nora C. McGee before the courthouse fire of 1933. (I've summarized for you here, but I had the actual wording in my notes.) Then I included the marriages for two surnames that I was researching in Wayne County. Oh, how I wish I'd known then to make sure that the source information appeared on each page that I wrote by hand. I sent an e-mail to a couple of friends who do a great deal of research in Kentucky. I mentioned to them that I'd probably gotten it from the Public Library of Cincinnati & Hamilton County. I also mentioned that if they couldn't identify the source that I'd have to hope that either the McClung Collection or Tennessee State Library & Archives had it. One of them quickly replied that it was not one source and that it was probably another which was available at TSLA. To look at that source is now on my "to do" list for my October visit to TSLA. Since I'm trying to identify the parents of Dicey Davis who married Charles Harris in Wayne County in 1811, I thought it might be helpful if I looked at some online family trees to see if any of them could shed some light on some of the marriages that I had collected. We all know how entertaining some of those trees can be, especially the undocumented ones. For example, I found the same marriage attributed to one husband who was said to have belonged to different sets of parents. I was attempting to locate a Marice Carter who married a Betsey Harris 10 Dec 1806 in Cumberland Co., Ky. I found a Morris Veale Carter, who married a Nancy Brown in 1813 in Nelson Co., Ky., whose parents were listed by one researcher as Edward Carter and Margaret Mason, but by most researchers (including ones with a greater degree of documentation) as Peter Carter and Amelia Veale. None of these trees identify an earlier marriage to a Betsey/Elizabeth Harris, but at least I have an annotation about it which might help in unpuzzling something in the future. Then you have the cases of the underage marriages. Did an 18-year-old man marry a 10-11 year old girl as one tree seemed to indicate in the marriage of Robert Davis to Sally Smith in Lincoln County, Kentucky in 1796? The tree, which lacks documentation, states that Robert was born in 1778 and was the son of Robert Davis and Jane Jopling. It states that Sally was born in 1785/86 to Martin Smith and Hannah/Joannah Stephens. Do we have incorrect birth dates? Or is this a case of misidentifying the wife? Or did an 18 year old really marry and underage girl? Once again, I have an annotation with plenty of questions for further research attached to this one for further investigation. I'm not a person who uses online family trees as a source for a final report. I'd much prefer to get as close to the original records as possible. These trees only provide clues for me. I want to see if I can build the families from the original records. I just need to know what other people are saying about the relationships and see if I come to the same conclusions from my own research. If there are disagreements between my conclusions and theirs, can I resolve the conflicts? This is a case where my annotated notes will prove more helpful than my genealogy software. I have not identified any of these families as my own, although they are in the same area as my families. 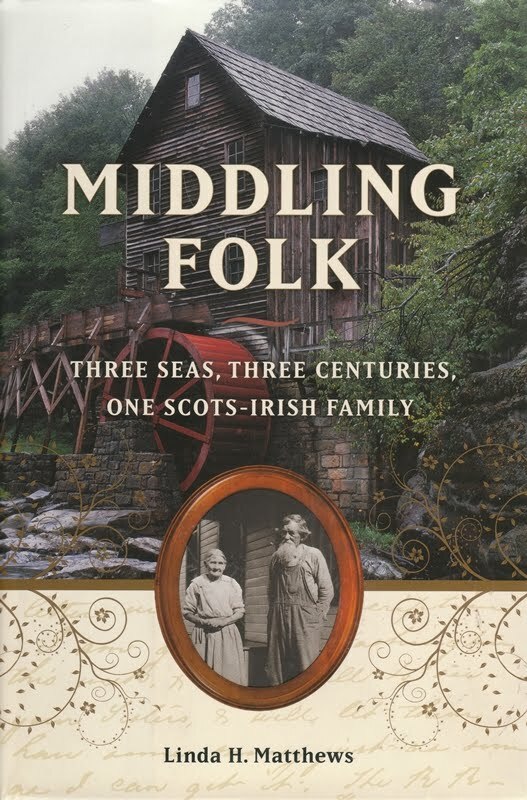 As I was reading reviews at work the other day, I ran across a review of Middling Folk: Three Seas, Three Centuries, One Scots-Irish Family by Linda H. Matthews. (Chicago: Chicago Review Press, 2010). 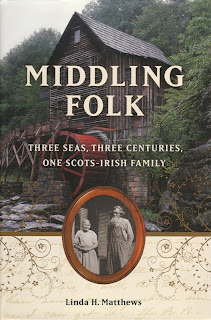 Matthews combines meticulous research and deft storytelling to show how the Scots-Irish Hammills--millers, wagon makers, and blacksmiths--lived out their lives against a backdrop of the American Revolution, the Civil War, and westward expansion. Readers will come away with a newfound respect for the ordinary families who helped shape this country and managed to hold their own through turbulent times. I just love it when the UPS man comes to my house. He brings packages with such interesting things. Today's delivery was a book I'd ordered from Amazon. Rohrer, S. Scott. 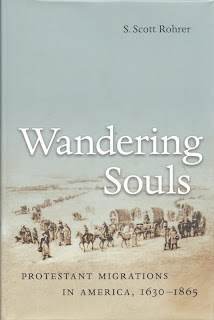 Wandering Souls: Protestant Migrations in America, 1630-1865. Chapel Hill: University of North Carolina Press, 2010. 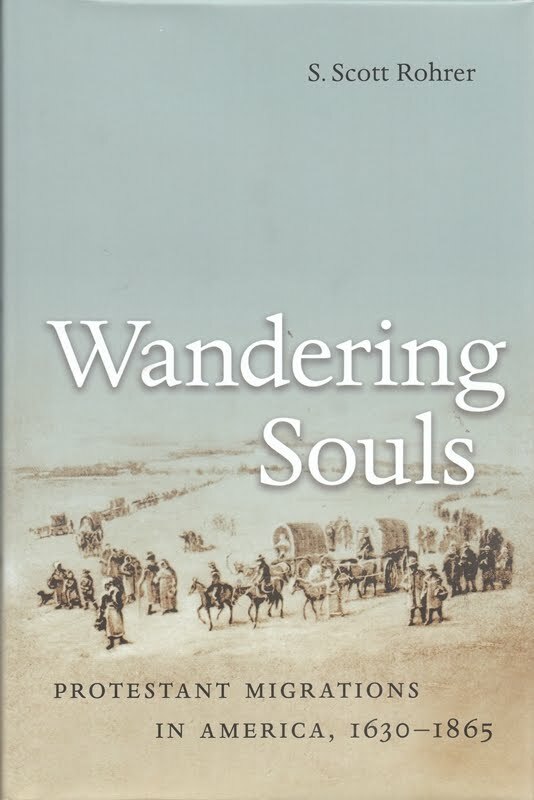 The book addresses migrations of several religious groups over the period of time mentioned in the title. The first chapter deals with the Puritans. The second with the Anglicans of Virginia. The third with the Scots-Irish Presbyterians. [The author of the book called them Scotch-Irish. I remember being told that Scotch is something you drink or a brand of tape. People from Scotland are Scots. However, most of us realize that we have to live with both spellings for this ethnic group.] The fourth chapter deals with Pietists (such as the Moravians). The fifth chapter deals with Methodists, specifically in the area that became Ohio. The sixth chapter deals with Baptists and Congregationalists. The sixth chapter deals with the Amana Colony in Iowa. The seventh chapter deals with the Mormons. I'm really looking forward to using this volume as I research my ancestors and the ancestors of others. I'm really glad that I stumbled across a reference to it the other day in a book review that crossed my desk at work. Yesterday morning, I decided to check Facebook before heading out to church. There was the beginning of a discussion on a photo that Pam Sayre had posted about a photograph of Linda Woodward Geiger and a Perkins cousin and his wife that she had met at the Museum of Appalachia during the FGS Conference in Knoxville. Linda had posted a comment about being descended from John Perkins and Judith Gater of Ipswich, Massachusetts. I quickly chimed in "Cousin Linda" for I, too, am descended from that couple. It wasn't long until Polly Kimmitt joined those claiming kinship. After comparing lines of descent, we discovered that Linda & I are 9th cousins once removed (with the common ancestor being the immigrant John Perkins and his wife Judith Gater), Polly & I are 9th cousins once removed (with the common ancestor being the immigrant's son John Perkins and his wife Elizabeth Evelith), and Linda & Polly are 9th cousins twice removed with the common ancestor being the immigrant once again. Since then, Bill West has also claimed to be our cousin. We'll have to calculate the degree of kinship when we have his line of descent. Now the really interesting thing was coming up with a way to cite a comment on a Facebook photograph that would meet Evidence Explained standards. I don't claim to have done it the way Elizabeth might have, but I came up with a way to do it since it is temporary documentation anyway (and not on my direct line). Update (9/7/2010): Bill and me are 10th cousins once removed. Bill & Polly are 11th cousins. Bill and Linda are 9th cousins twice removed. Other Perkins cousins found are Melinde Lutz Sanborn, Natalie Cottrill, and Randy Seaver. We don't have enough info at the moment to calculate the degree of relationship to the last three. Natalie and Bill do share a descent through John & Judith's daughter Mary. Update (9/9/2010): Randy Seaver and Linda are 9th cousins twice removed. Randy, Bill, and Polly are 11th cousins. Randy and me are 10th cousins once removed. I've just returned from worship today. Our pastor is wonderful, and his message today was very uplifting. Only a few more hours until the launch of a new ministry for our teens with which I'll be working. It's called "Exalt!" and will involve praise and drama teams. I will be working with the praise teams. I stopped at O'Charleys on the way home to grab a bite to eat. I ordered the black and blue salad, but I kind of feel that I was cheated on the blue part. The blue cheese crumbles were so fine inside the dressing that you couldn't even see them. If I had not tasted the flavor, I would not have known they were there. The steak was cooked as ordered and was tasty, although it was definitely not the best grade of meat available. The bacon crumbles were almost overpowering. I think I would have preferred their omission. I guess that it just wasn't like the black and blue salad I would have made! My feet are beginning to recover from those concrete floors at the FGS Conference in Knoxville. I think that they'll be fine by next weekend. I spent yesterday scanning 297 pages of documents that I photocopied on a recent research trip. I will be using these documents along with some other materials already in my possession and some research yet to be done to create an account for future publication. I'm just not sure yet how far into the future it will be, but I will be writing, documenting, and looking for any gaps in the narrative as I go. I think it's about time for the Sunday afternoon nap! My cat has already begun his. I'd love to provide you with a nice long recap of the FGS Conference in Knoxville, but I expect that I would put most of you to sleep if you heard my recap. My duties as audiovisual chair kept me putting a lot of miles on my feet during the course of the conference. I was able to spend a little over four hours on Tuesday at the McClung Collection of the East Tennessee History Center, providing expert assistance for researchers. During "Focus on Societies" Day, I presented Organizing Your Society's Library and Archives. During the main part of the conference, I presented Appalachian Resources of the Appalachian College Association and Alabama Ancestral Sources. I was honored to have the author of one of the resources I mentioned as a general source in attendance at that last session. It was fun to meet a few genealogists that I only knew through Facebook, and it was fun spending time with so many that I only see once or twice each year. Everyone seemed to enjoy the restaurants on Market Square. I don't know if it still holds true, but I know that at one time Knoxville was said to have the most restaurants per capita. I think several of them were enjoyed by conference participants. It was exciting to have so many people enjoying this area. Participants also really seemed to enjoy the outing to the Museum of Appalachia. There was plenty of time to network while enjoying music and Appalachian heritage and culture. It will take my feet a couple of weeks to recover, but the conference was a huge success, so I guess the foot pain was worth it. I'm now back at work so I can get a little rest! Have your reading choices changed over the years? Or pretty much stayed the same? They are not talking about differences between childhood and adulthood, but the reading choices that you make in adulthood. I do plan to comment a bit on my reading choices in my later elementary, middle, and high school years and how they evolved into some of my adult choices and then how my tastes have (or have not) changed. In my later elementary years, I was hooked on the Hardy Boys series. I loved to follow Joe and Frank and all their sleuthing adventures. I basically loved any other book that involved a nice light mystery, although I never really read Nancy Drew. My brothers had owned some of the Hardy Boys series so I started with them and never really switched to Nancy. In fact, one of my classmates (who died earlier this week) was collecting the Hardy Boys books and often loaned his copies to me to read. As an adult, this love for the light mystery developed into a love of the cozy mystery. It's still one of my favorite genres -- but only if it is well-written. There are so many new cozy series that are developing right now that just are not that interesting or well-written. I guess that you could say that I'm more discriminating in series and know that I can't possibly read them all so I only read the ones which really appeal to me. During high school, especially during the summer months, I received huge quantities of Harlequin and Silhouette romances that had their covers removed. I know now that these had been reported as being destroyed, but I was a voracious reader, and it kept me occupied. I would often read two a day. I never was a huge fan of the romance, but I loved the settings -- Greek Islands, coastal locations in the U.S., Hawaii, etc. As an adult, I rarely read the romance. I'm not even a huge fan of "chick lit." What I do enjoy is a good travel narrative! I also enjoy reading books set in a variety of places. Now, let's take a look at some of my reading tastes as an adult. In my early adult years, I read a vast amount of Christian fiction. It was a fairly new genre at the time, because prior to that most Christian fiction was a somewhat fictionalized biography of some Biblical character. I guess that I had read Eugenia Price books in high school, but I really think the birth of Christian fiction as a genre occurred with the publishing of Janette Oke's books. I used to read lots of Christian fiction books, but I got tired of them. It was the same formula over and over, and for many of them, the incorporation of the plan of salvation at the end of the book seemed rather forced. I won't say that I've entirely given up the genre, because there is an occasional Christian writer who writes well. If a plot sounds like something I would enjoy, I might give the author a try, but I'm not likely to give them a second chance if the writing does not measure up. It's just not a genre that I frequently read. As far as mysteries go, I am much more diverse in my reading. I still don't really like hard-boiled novels, but I do like police procedurals as much as the cozy featuring the amateur sleuth. In recent years, I've begun to really enjoy some of the Scandinavian mysteries that are increasing in popularity with American readers. British ones are among my favorites. I've always had a love for history. As an adult that love has increased. I read far more true histories now than historical novels as I did several years ago. I guess I'd rather make sure that the facts are there and properly documented! I've also become more adventurous in my reading. Part of this is because a friend and I regularly exchange books. She has introduced me to some wonderful authors, and I've introduced her to some as well. The two of us decided to participate in some of the LibraryThing challenges. To complete some of the challenges, we are stretching our boundaries and discovering books that we otherwise would never have discovered. We both discovered a wonderful Canadian book called Mrs. Mike that is reminiscent of some of the prairie romances that are set in America. We've discovered other Canadian authors that we would not have discovered otherwise. The Europe Endless challenge encourages us to find a book set in every European country. We're really stretching in the boundaries here! Do you know how difficult it is to find books set in some of the smaller countries? The 1010 challenge encouraged us to read 10 books in 10 different categories for 2010. I have enjoyed this challenge and the discoveries of new authors. One of my categories is "Caribbean." I've read or will read books by authors such as Michelle Cliff, Jamaica Kincaid, and Andrea Levy that I otherwise might not have discovered. I've discovered that I like diversity in my reading. I've got a huge to be read pile of to-be-read books with Asian (including some of the Asian Middle Eastern countries). I'm making Asia one of my categories in 2011. I had gotten turned off by mysteries featuring archaeologists a few years ago. (It was probably the presence of one snake too many. I really don't even remember now.) However, I've rediscovered these, and I have a lot of catching up to do. Many of these are some of the better-written mysteries out there. So, yes, my reading has evolved over the years, but it has also stayed the same. I just have a more mature reading pattern that involves books written at more mature levels as well as those that are more "fluff." I just noticed an obituary on a genealogy blog copied and pasted from either Legacy.com or from the electronic edition of a newspaper which published the same version. The blogger did not include a link to the original location, nor did she include a source citation for where she obtained the item. The blogger is not giving credit where credit is due and is, therefore, guilty of plagiarism. As often as we hear the three words, "Cite your sources," in genealogical circles, you would think that the proper documentation would have been automatic. I also just noticed a post by another genealogist who wishes that she had not shared information with another genealogical researcher. Why? Because that person had posted the information and photos shared without proper attribution. I wish I had a dollar for every time I've heard this sentiment echoed. I'd be a rich person. CITE YOUR SOURCES, people, CITE YOUR SOURCES. We have lost a beloved educator, storyteller, and blogger. Terry was my second cousin once removed. His parents were Garfus Sherman Thornton and Letha Doris Hollingsworth Thornton. He was born and grew up in the Parham Community of Monroe County, Mississippi. He has immortalized this area through his blog, “Hill Country of Monroe County, Mississippi” and through his columns in the Monroe Journal bearing the same title. He graduated from Hatley High School and the University of Mississippi. He served as principal of Amory Middle School at one time and later went on to be a professor at Troy State University in Alabama. He retired to Rinnie, Tennessee, near Crossville. (He always did like those hills.) He later returned to Mississippi to be nearer his family, residing in Fulton in Itawamba County, just north of his beloved Monroe County. Terry’s wife Betty, sons Teb and Jim, and brother Sherman survive him. Terry was a born storyteller. He loved to relate stories of the family. Several years ago, he started a newsletter for family members called “The Thornton News.” It was sent to all descendants of Richard Thornton and his elusive wife Agnes. [We’ve since determined that Agnes’ surname was Branum or Barnum.] In one of the earlier issues of that newsletter, he related why Monk Thornton had to move to Georgia. It was very entertaining. He also related the story of the “worm” (a moonshining term) that he later shared on his blog. We all looked forward to his contributions. After the demise of the newsletter, he eventually turned to blogging to share his stories – not just with his own family, but with others as well. His gift of relating a story made his blog a favorite of many. He had a following, not only in the blogging community, but also in the “Hill Country” area. He was asked to share his stories with the readers of the Monroe Journal (a merger of the Amory Advertiser and Aberdeen Examiner). He did so in a biweekly column as long as he was able to continue. Memorial gifts may be made to the Itawamba Historical Society of which he was a member. Address is P.O. Box 7, Mantachie, MS 38855. His obituary and online guest book for those wishing to express condlences to the family are available here: http://www.legacy.com/funerals/eepicklefuneralhome-amory-smithville/obituary.aspx?n=william-terrance-thornton-terry&pid=144608502. One more quick memory: Terry loved his catfish from Pickles on the Hill in Amory! He would have to stop there every chance he got! William Terrance "Terry" Thornton died last night. E. E. Pickle Funeral Home in Amory, Mississippi is in charge of arrangements. There will be an online guest book for folks to send their condolences to the family. More later. Many people in the genealogy community have appreciated Terry Thornton's Hill Country of Monroe County (and the predecessor). I've been struggling with whether or not to say anything or not, but I feel compelled to ask everyone to add Terry and his family to their prayer list. He's terminally ill and has only a short time to live. Terry & I have a common ancestor in James M. Thornton (1825-1913). It's hot in East Tennessee. Many genealogists will be coming to this area in less than two weeks and might be looking for a way to cool off. I've come up with a solution -- tour a cave. In the Townsend area, you will find Tuckaleechee Caverns. It is open 7 days a week from 10 a.m. to 6 p.m. The temperature is 58 degrees year-round (even when the heat index exceeds 100 degrees as it has all this week). Another options is Forbidden Caverns. Located east of Sevierville near the community of Chestnut Hill, these caverns are also 58 degrees year-round. They are open daily except Sunday from 10 a.m. to 6 p.m. during the months of April through November. Last night, Bill West from over at West in New England mentioned in his Facebook status that Danielle Steel's new novel "features a heroine tracing her genealogy to solve a family mystery." The book entitled Legacy will be released 28 September 2010 according to Amazon.com. I don't normally read Danielle Steel's novels, but this is one that I'll be sure to check out of our library. The publisher's blurb even mentions that the heroine makes discoveries at Salt Lake City's renowned Family History Library. I think that seeing this blurb really made me miss the Rett MacPherson cozy mystery series featuring Torie O'Shea. It's been a couple of years since Rett came out with a new novel in the series. I always eagerly awaited the next installment. When I noticed there were no forthcoming installments of the series on either the publisher's site or the author's site, I emailed the author awhile back. Her response indicated that she was spending her time on other things and not writing a novel at the present time. I was very sad. I keep hoping that she'll resume the series, but as the time passes so does the likelihood of that happening. Over the years, there have been a number of short series featuring genealogists and several stand-alone or individual novels in a series featuring persons on a quest for their family's story. There are a number of sites online which list many of these titles although some are becoming slightly dated. I just wish that we had a current cozy mystery series that provided some escapist reading for those of us who enjoy family history. I hope someone will undertake the challenge of writing such a series. In the meantime, I will just have to enjoy books such as Danielle Steel's upcoming mystery (which I hope is well-done) to get my "fix" on genealogical escapism! Two weeks from today, APG will be holding its Professional Management Conference in Knoxville, and two weeks from tomorrow, the Federation of Genealogical Societies Conference begins with its Focus on Societies Day. Many librarians have already pre-registered for the COMPLETELY FULL Librarians' Day which will be held at the Hilton on that day. All of us here in East Tennessee are looking forward to greeting all of you who are coming! I spent a good part of the afternoon at the Knoxville Convention Center ironing out a few last minute details with their wonderful staff. After that, I ran over to the East Tennessee History Center for a few minutes. I noticed that the museum gift shop is really filled with things that genealogists will enjoy purchasing! I stopped by Coolato Gelato which is just across Gay Street and barely down in the next block from the History Center to enjoy a small hazelnut gelato. On a day with a heat index of 103, the gelato really hit the spot! (Of course, I enjoy their gelato any time I have an opportunity to do so!) There's also a French Market Creperie, Lenny's Sub Shop, and the S & W Grand Cafe in this block. Knoxville's Market Square is actually a block nearer the convention center and offers many dining opportunities. Market Square Kitchen is known for its soups, but offers sandwiches and other foods as well. The Tomato Head is a local favorite. The offer vegetarian entrees as well. You can build your own salad at Trio Cafe. When you walk in, get one of the menu slips and pencils and circle the ingredients you want on your salad. They have other menu items as well. If you are in a Latin mood, try La Costa. It's gaining a great reputation and a strong following. In the hot weather, Rita's on Market Square is a popular place. They serve Italian Ice and Custard. Oodles Uncorked is another restaurant in Market Square. Be sure to check out the Market Square District Association page for more information on restaurants in Market Square and on Gay Street as well as other merchants in these areas. Is Your Organization at Risk of Losing Its Tax-Exempt Status? I saw an article on one of the local television station web sites that was encouraging people to check the IRS list of organizations at risk of losing their tax-exempt status to make sure that theirs was not listed. I'm not sure what types of organizations that I expected to see on the list as I clicked one state, but I was alarmed at what I did see. There are many historical societies, Friends of the Library organizations, cemetery associations, fraaternal organizations, and DAR chapters among those in danger. According to the IRS site, "Tax-exempt organizations that do not satisfy annual filing requirements for three consecutive years automatically lose their tax-exempt status. The IRS is providing one-time relief for such organizations that have filing due dates on or after May 17 and before October 15, 2010. The list includes organizations for which the IRS does not have a record of a required annual filing for 2007 and 2008, and whose 2009 return, due on or after May 17 and before October 15, 2010, has not yet been received." PLEASE CHECK to make sure that organizations with which you are affiliated are not included on the list. There is a PDF or Excel file available for each state. This has been one of those "hot" summers where the temperature seems to want to hover in the 95 to 100 degree range. I don't deal well with "hot." I'd much prefer for it to be cooler where I can add layers of clothing or blankets, if necessary. About the only thing "hot" weather accomplishes for me is a sunburn. I can remember short periods of time where we've had hot weather in recent years. For example, about 10 or 11 years ago, our choir took a trip to New Orleans around Labor Day weekend. The temperature was 100 or above for our entire trip and had been for a few days. The last time I really remember these extended periods of very hot temperatures was back in the late 1970s when I was in high school. I remember that the temperature was above 90 for almost the entire month of June. One reason I remember it so well was that I was working at our church camp that entire month as a counselor and canteen manager. The heat was awful. Those of us on staff would go for swims at night after the kids were in bed. Then we'd raid the kitchen before we went to bed. Those were some fun times with a lot of special memories! Have you been looking for a genealogy course that offers college credit? Jackson State Community College in Tennessee is offering a 3-hour "Introduction to Genealogy" course which will be taught by Tennessee State Librarian and Archivist, Charles Sherrill. The course will focus mainly on Tennessee genealogical research, but it will cover many source types. Cost of the course is $395. It runs from August 28 to December 15, 2010. The deadline for registration is the first week of class, but you will not want to wait that long to sign up. The course is being taught online and does not have set meeting times. To speed things up, mark "non-degree seeking" on your form so that you don't have to do pre-admissions testing or send high school transcripts. The admissions form is at http://www.jscc.edu/admissions. LIB 1001: Introduction to Genealogy. Students in this in-depth course will become familiar with many online and print sources, will interact with one another and the instructor in discussion forums and email, and will complete lessons to learn interesting genealogical skills. Class participants will also have access to Ancestry Library edition through ProQuest. Those interested in taking LIB 1001 in the fall semester at Jackson State Community College will need to apply for admission to the College online at http://www.jscc.edu/admissions. There, find the online admission form, and enroll as a non-degree-seeking student to avoid needing to send transcripts and taking placement testing. The campus ID you are sent upon admission will allow you to register for the course online. I was quite surprised to learn that I had been selected as a "Top 100 Genealogy Site" for 2010 by MyHeritage. I've had so much going on the past few months that I feel that I've neglected the site. However, I'm grateful for the recognition and glad to be back to blogging at least semi-regularly. Congratulations to everyone else who has earned this honor, and welcome to new readers who have found me via this link. One of our student workers who was working in Interlibrary Loan came to me to ask for assistance locating an "article" she needed to retrieve. As I looked at the request, I noticed that the requesting library wanted to borrow 4 microfilmed rolls of the 1850 slave schedules. I told her that they were really wanting to borrow the microfilm (which we do not loan via ILL). She showed that the library had filled in the article line with "slave schedules." I decided to show her what the slave schedules were. I popped up the 1850 Jefferson County, Tennessee slave schedule and showed her how it listed the slave owners and the demographics for each slave. I told her that it did not name the slaves -- just the owners. It really caught her interest, and she began to ask questions. I told her that she could often find the names of the slaves in deeds and in probate records. She was amazed that these records still existed. I'm glad I took the time to show her what had been requested. I hope it may have sparked an interest in genealogical research. As I was browsing through the posts of a certain unnamed online query system for an unnamed county this weekend, I noticed a follow-up to a post that made me go, "And how did you know that, Mr. Responder?" You see, the person responding to a query by someone who was obviously fairly new to slave research cited his own experience in growing up in that county as the basis for his reply. The only problem was that in order for him to have had that personal recollection, the responder would have had to have been born by about 1852. While I really do not doubt that his response had some truth in it, I believe he needed to be more explicit in citing his sources. The responder probably had heard the story from his parents and/or grandparents who had heard it from a generation that had lived during the Civil War era. He needed to cite that source rather than his own personal experience of growing up in the county (since I don't believe that the responder was close to the age of 160). It would have also been nice to have had other sources to back up the statement that was made. I believe that there could have been some newspapers, journals, letters, and even other published items that would corroborate the statement. Even a close study of the 1860 census (combination of population, agricultural, and slave schedules) would have shown the veracity of the claim. My problem was entirely with the manner in which the information was presented because I knew that the source cited was not the actual source. Most of us realize that the standard is that we should cite the actual source used. If our source is a derivative, we need to indicate this. I do a lot of research in archival materials. Often researchers are requested to use a preservation photocopy or microfilm rather than the original if the pages are brittle. I try to remind myself to make that notation that what I used was the preservation photocopy. (I rarely have difficulty remembering to indicate the microfilm.) Recently I used the preservation photocopy in one repository and was able to use the original because of a "problem" I found on the photocopy and needed to clarify by examining the original. It turned out that there was no difference in the two, but I needed to make sure that something had not been omitted in photocopying. The rounded page edges seen on the photocopy seemed to indicate that nothing was omitted. The sentence structure between the two pages matched, but there was a numbering issue that made me realize that it was likely the clerk had either omitted something or lost track of his numbering. Without examining the original to see if there was something inserted or in a margin, I could not be sure that the entry was complete. It would have been wrong for me to have cited the original if I'd examined only the preservation photocopy. As it was, I could actually cite both the original and the preservation photocopy. Cite only what you have actually used. When citing personal experience, make sure it is your own and not something that has been passed down through the family. Give credit to those ancestors who shared the story with you! I will never forget the time that I took my mom to visit the land that had been the childhood home of her grandmother along the banks of Bull Mountain Creek in Itawamba County, Mississippi. Mom's grandmother had lived with her family when Mom was growing up in neighboring Monroe County. She'd heard her grandmother telling stories of the flooding "when Bull Mountain broke loose." When Mom saw the property and the creek, which was muddy and a little choppy and high on the day we visited, she was able to visualize those stories that her grandmother had told her when she was growing up. As I watch the devastation in the Western and Middle parts of my state and listen to my friends telling their stories of cars submerged and floating in the raging waters of the Cumberland and Harpeth Rivers and all the many creeks and tributaries, I wonder how many of the descendants of the persons who survived this spring's devastating floods will hear stories of "when the Harpeth broke loose" or "when the Cumberland broke loose." The images I've seen on my television and computer screen are devastating. I've seen areas that I used to frequent when I lived in the Nashville area under water. My prayers go out to the people in the flooded areas of Tennessee and Kentucky. Camera Found in Lamar Co., Ala.
A camera was recently found in Lamar County, Alabama on Matthews Road near Vernon. The camera was smashed, but the card is still readable and contains many photographs taken in cemeteries. 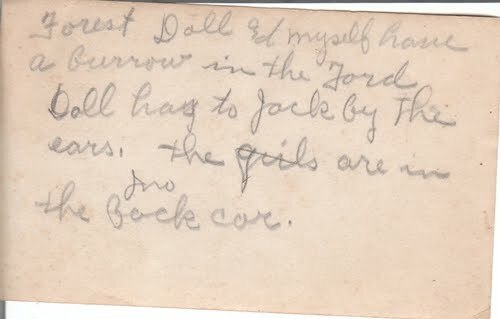 If you are the owner, please contact the Lamar County Genealogical & Historical Society. Who or What Sparked Your Enthusiasm for Genealogy? Who or what sparked your enthusiasm and passion for genealogy? In my case, it was my Mom. Mom had always wanted to know more about her grandmother's family. She had even made a trip with her mom once to the courthouse in the middle Tennessee county from which she knew her family had come to Mississippi prior to her birth only to be told that all the records would have been lost due to a courthouse fire in 1865. I'm not really sure what I thought when I first decided to see if I could find additional information for her, but I certainly didn't dream that I'd develop the passion and enthusiasm for genealogical research that I did. I was living in a city that had one of the top ten genealogical library collections in the country at the time. History had always been my favorite subject in school, even though I didn't major in it in college. I think I thought I'd find the answers for her and move on with my life. What happened is that I quickly became so engrossed in the study of my family that I moved from one line to another too quickly, a bad habit of many beginning genealogists. I also made the mistake of beginning with poor genealogical software. This was back in the days of smaller hard drives and 5 1/4 inch floppy disks. I had a freeware program that allowed the input of basic information and 10 lines for notes. I was an academic and realized that I needed to cite my sources, but how could one do that properly in 10 fixed-width lines? I also had many other things I wished to include in the notes. I developed a short-hand for my sources, but the truth was that I had to go back to paper copies of notes for many of them. Even today I still come across old entries in my genealogical database that I have to fix as I discover them and as time permits. I'm sure I also made other errors when I first began my genealogical research. I know that I jumped to a few conclusions about who an ancestor's parent might be before I had really performed that "reasonably exhaustive search" that standards require. In fact, there are probably things out on the Internet that I posted long ago (as recently as 9 or 10 years ago) that I would cringe to discover now. I've made the observation to other genealogists that I wish I had time to go back and review the data and conclusions on each of those lines. I never seem to have time to work on my own families any more. That's okay though, because I've discovered a lot of families that are much more interesting than my own in the process. I know one genealogist that sets aside a few hours each weekend to work on her own families. Maybe one of these days I can budget that time for myself but since I still have a regular job, the weekend is my only time to do a lot of things, and I'm very involved with church activities which takes most of Sunday. I spent last night working with a most interesting church record from the 1820s. It was a case of church discipline. I hope to one day take the research plan I developed and turn this one into a full-fledged article for publication. This person definitely broke several of the ten commandments! I'm glad that my mother was curious about her family. If she had not been, I may have never discovered the wonderful world of family history and genealogical research. Who or what sparked your enthusiasm? Feel free to comment here or leave a link to your own blog post sharing the answer to that question. I've spent a lot of this month to date trying to get caught up on things. The 2010 FGS Conference is coming up in August, and I've been doing a lot of work in preparation for it. We'd love to have you come visit East Tennessee then! I also went to North Carolina Genealogical Society's Spring Seminar on April 10 in Wilkesboro. Mark Lowe was the featured speaker. We all had a great time of learning and of visiting with genealogy friends that we don't get to see as often as we'd like. This past week has been filled with extra rehearsals for our choir's spring musical, "Savior: Jesus Messiah." We presented it last night. I heard a lot of positive comments from people who had attended. There is lots to do this week as well. I've got a book that I need to finish reading so that I can get the review written by the end of the month. I've got an indexing deadline for Christian Periodical Index that is also looming for May 1. I've got a self-imposed deadline for another project this week. I've got some other deadlines for mid-May. I'm working on five to six presentations that will be made at various conferences this summer. (The 6th one isn't confirmed yet but will probably take place in July.) One of those may be repeated at another venue. I'm really looking forward to seeing Greater Vision in Knoxville this coming Saturday night. This will be Chris Allman's first weekend back with them. Chris was their original tenor. I can't wait to hear those guys together again! As I was reading the blogs that I have in my feeds, I came across a book that someone had just purchased. It was entitled Contested Will: Who Wrote Shakespeare? Like any other genealogist, my reaction was that I would have much preferred the book without the subtitle. It would have been much more interesting if it had been a probate court dispute. I've been reading on Facebook and on blogs about the UPS man visiting all my friends who pre-ordered the iPad. So far, most seem to be opting for WiFi but not WiFi + 3G. I will admit that I'm a little envious! As I read some of my newspaper feeds and saw photos of folks standing in line awaiting their iPad, I was certain the folks who pre-ordered theirs were smarter! One of the blogs I read is entitled Mystery Lovers' Kitchen. Yesterday, they had the most marvelous family story and recipe for Easter Pie Palmiers. The story and recipe were shared by Cleo Coyle, author of a series of books set in coffee shops. I thought all my genealogy friends would appreciate the story! Speaking of food, I love lemon. I love blueberries. I love scones. I may just have to try these. I had really intended to be better about blogging, but the circumstances of last month interrupted my resolution. Many of you know that my Mom had called me about 2 or 3 weeks before my spring break and said that she and Dad were tired of being cooped up in the house and wanted to go somewhere during my spring break. I began to look for places along the Gulf Coast where I could find a room with furniture comfortable enough for them but which would allow us to bring along my cat (because Mom would have been upset if she hadn't get to see her grandcat). I settled on a place in Fairhope, Alabama on the Mobile Bay but very near to Gulf Shores. We went down on Sunday the 14th after going to their church and to the country club to eat lunch. We ate that evening at a place I'd found on the Internet with great ratings that was not far from Fairhope. We didn't try to do a lot Sunday night because I knew that the drive down was pretty exhausting for the two of them. On Monday, we did quite a bit. After breakfast, the elevator was broken so I had to take the stairs up to the third floor and get everything we needed for the day out. We began our day by heading to the Fairhope Pier. They have a very nice park right on the bay. I walked to the end of the pier, but Mom and Dad stayed close to the car. It was a bit chilly for them. After that, it was still too early to head to the shops downtown so we headed to Burke's Outlet which was open. Mom found several clothes. She'd lost a lot of weight in recent months and was just beginning to rebuild her wardrobe. We found several things that she could use. Then we headed to downtown Fairhope. Fairhope is a unique little town. The Indie-Bound affiliated bookstore was incredible. I purchased a book on the history of Baldwin County, Alabama (which I still haven't had a chance to read). I poked my head in several other stores. Before long, it was time for lunch. We had chosen Panini Pete's which has been featured on the Food Network. It really was worth the hype. Mom and I shared a sandwich. I ended up getting to try a bite of Dad's too. Both were great. As we were heading back to the car, there was a local TV station crew filming along the sidewalk. Mom and Dad walked in front of the cameras and ended up on the evening news that night. I saw the cameras and walked behind them. We headed back to the hotel, hoping the elevator would be repaired so Mom and Dad could get some rest before heading to Gulf Shores for the evening. When we got there, the elevator repair crew was there, but they still did not have it in working order. We decided to just take the scenic route to Gulf Shores. We headed down the scenic route along the bay, stopping at the Punta Clara Candy Kitchen in Point Clear. We knew from previous trips that we would want some of their pralines, but I also fell in love with their margarita pecans and had to get a bag of those as well. Mom and Dad picked up some pecan brittle and white chocolate covered pecans in addition to their pralines. We headed on down to Gulf Shores. We drove around a bit and enjoyed the beach. That evening we ate at Lulu's, a restaurant on the Intercoastal Waterway owned by Jimmy Buffet's relative. I don't remember what Dad had, but Mom & I shared the mahi tacos. I'm glad that it was good because we went early and still had to wait an hour for seating. Fortunately they had benches, a gift shop, etc. to make your wait more comfortable. That was the last meal Mom was able to eat. She began to get sick on the ride home. It really started out as just phlegm that she was spitting up. The next day, we planned to take it easy in the morning since Mom had not been feeling well the night before. We went down to breakfast, but Mom couldn't hold anything down. I had discovered that I'd somehow missed one of the shops that I'd wanted to visit to pick up a gift for a friend. We had planned to go. Around mid-morning, Mom suggested that I go on without her because she had a feeling that she wouldn't be able to go. I stopped and picked up a 7-Up on the way back to see if she could hold it down. That didn't work. My cousin who lived in nearby Daphne was picking us up for lunch to take us to the Grand Hotel in Point Clear. We decided to leave Mom in the hotel and that we'd just bring her nephew up to visit her when we came back. After he left, Mom still was having trouble holding anything down. She and Dad took naps. While they were napping, I went out. At the Dollar Tree, I purchased a bucket that Mom would be able to use to spit up in if we were in the car. At Winn-Dixie, I purchased some pre-made Jello, hoping she could hold that down. When I got back, she tried. I looked at her and said that we needed to get her to a hospital where they could get her rehydrated. I gave her the option of the St. Thomas Hospital in Fairhope which was about 2 blocks from the hotel or of checking out of the hotel and driving back to Mississippi. She didn't want to mess up the vacation and was going to settle for Fairhope, but I reminded her that they would be admitting her. She then decided to go back to Amory. We checked out at 6:30 p.m. (after Dad & I made a quick run to Wendy's for supper) and got the car loaded. We got back to Amory at 11:45 p.m. where I delivered the cat to their house and quickly repacked a suitcase so that we would only have items Mom needed in the suitcase we were taking to the hospital. We got to the hospital a few minutes after midnight. At first, even the doctors at the hospital thought we'd get her rehydrated and she'd go home. Later they thought that perhaps the esophagus had narrowed where it meets the stomach so that she couldn't hold things down. One of the surgeons was going to take a look at that Thursday morning, but after Mom took a turn for the worse in the wee hours of Thursday morning, that was no longer an option. They had to do tests which did not require her to undergo anesthesia. We moved her to ICU. The doctor told me Friday morning that the ultrasound showed that Mom's cancer had returned and spread to the liver. There was nothing that could be done. He didn't think she'd ever leave the hospital. I pretty much stayed at the hospital except to run home for a quick shower from then on. Her state of health continued to deteriorate, and she went home to be with the Lord at 4:33 a.m. Central Time on Monday the 22nd. I was with her the last 10.5 hours. The funeral was on the 24th. I look forward to seeing my Mom again in heaven! The State Library of North Carolina and State Archives have been busy adding records to North Carolina Family Records Online. They have added 249 new records this week, bringing the total number of records in the project to 731. If you are a resident of Tennessee, you may be interested in webinars on the use of Heritage Quest being offered by the Tennessee Electronic Library on March 16 and March 18, 2010. Beginner and advanced workshops are being offered. You must register in advance. I'm really glad to see that the state of North Carolina changed its mind because of folks who complained. All of U.S. history will be taught in North Carolina high schools, not just 1877 to the present. Apparently there is a proposal in North Carolina to cut pre-1877 United States history from the high school curriculum. As a genealogist, I find this distubring. Registration for the 2010 Federation of Genealogical Societies Conference, scheduled for 18-21 August 2010 in beautiful Knoxville, Tennessee, is now open. This year’s conference theme is “Rediscovering America’s First Frontier,” and is co-hosted by the East Tennessee Historical Society and the Kentucky Historical Society. The conference schedule includes 173 presentations by 73 noted speakers, including a large number of sponsored luncheons with speakers. There will be two exciting evening events: “Come Sit a Spell: Ballads, Mountain Stories, and Country Fare,” organized by the host societies; and the annual gala FGS banquet, “An Evening in Old Appalachia,” which will be held at the fascinating Museum of Appalachia. The exciting program includes a completely redesigned “Focus on Societies” day that will present societies’ officers, as well as their members and volunteers, with all new programs and focus group sessions to help improve their operations and effectiveness. ProQuest is sponsoring Librarians Day, a full day of free sessions for librarians and archivists that includes a tour of the outstanding McClung Historical Collection of the Knox County Public Library. FamilySearch will present an extensive track of sessions about its resources and projects that you won’t want to miss. Ancestry.com will present a free day of classes for the public and conference attendees on Saturday, plus they will offer free document scanning sessions to attendees by appointment throughout the conference. The Genealogy Guys Podcast will also be there to record a “live” session at the conference. The Exhibit Hall will be filled with a wide array of vendors and organizations, and a special Spotlight on Societies area will showcase local and regional genealogical and historical societies. There will be extended Exhibit Hall hours on Friday evening, followed by a gala reception, hosted by FamilySearch, to kick off the 1812 Pension Files Digitization Project. There are more activities and research opportunities too numerous to list. However, you can learn all about the 2010 FGS Conference and register for this exciting four-day event at http://www.fgs.org/2010conference. Be sure to also visit or subscribe to the FGS Conference Blog at http://www.fgsconferenceblog.org for lots more information and travel advice. We look forward to seeing you in Knoxville in August!